Driving a dependable Subaru vehicle is an amazing experience and keeping up on routine maintenance is the best way to get the most out of it! At Carter Subaru Shoreline in Seattle, WA, we know that it's not always easy to find time or money to maintain your vehicle which is why we strive to not only make every visit hassle-free but to save you money at the same time. We're proud to offer frequently updated special offers on the services and maintenance procedures your Subaru needs as well as savings on genuine Subaru parts, fluids and chemicals if you're more of a do-it-yourselfer. Take a look at the savings we're currently offering and then schedule your next service visit to take advantage of our outstanding service at Carter Subaru Shoreline! Your Subaru is an amazing vehicle, precision engineered for longevity and dependability, so who can you trust to take care of it properly? Your first choice should be the factory trained technicians in the state-of-the-art Subaru service center at Carter Subaru Shoreline in Seattle, WA. We know your Subaru best, inside and out, and we strive to deliver excellent value every day. In fact, when you purchase a new Subaru from our extensive selection of new vehicles, you get the Carter Advantage - exclusive benefits such as hassle-free courtesy loaner cars, prompt shuttle service and much more. Speaking of value, don't forget to check out our frequently updated special offers on new Subaru vehicles, our genuine Subaru parts and accessories coupons and savings specials on service, maintenance and repair. 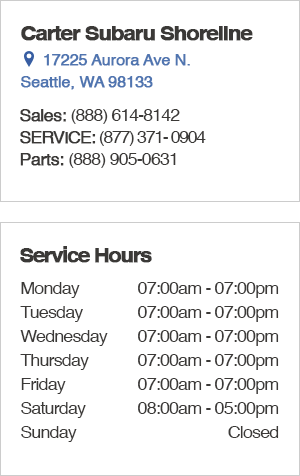 Schedule your next service visit online or give us a call at (877) 371­-0904. We're located conveniently at 17225 Aurora Ave N., Seattle, WA 98133, worth the trip from Mountlake Terrace, Lynnwood or Snohomish, WA. We look forward to showing you what truly world-class customer service looks like at Carter Subaru Shoreline!